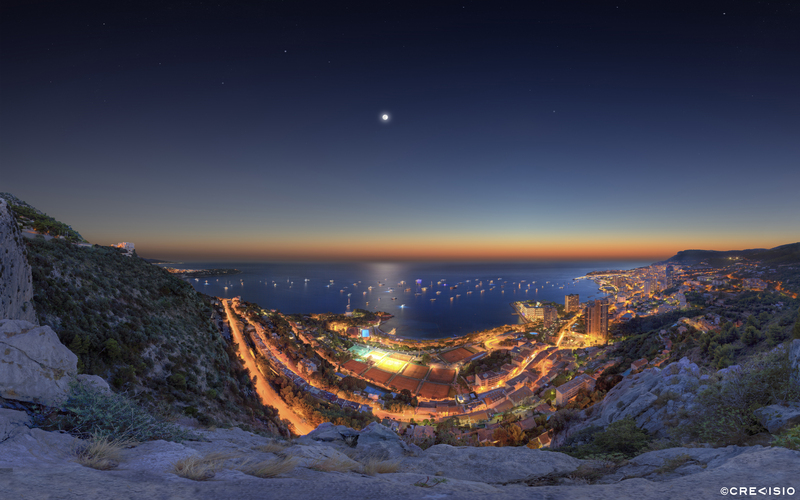 Twilight sunset panorama over the 2015 Monaco Yacht Show in the Principality of Monaco. This photograph was taken from a rock above Monte-Carlo during the second evening of the world's largest luxury yacht show. During the same evening, Ferrari held a private launch party presentation of the new Ferrari 488 Spider at the Monte-Carlo Beach Club. The 403 megapixel photograph has a full resolution of 21,730 x 13,581 px at 300 dpi. A free ultra high resolution version (10,240 x 6,400 px) is available for download for personal use by clicking on the link below. For commercial use, please contact Crevisio.